The Virginia Tech College of Engineering's Robotics and Mechanisms Laboratory (RoMeLa) has captured another top award for its updated innovative robotic hand that can automatically change its grasping force using compressed air. A team of five undergraduate students won First Place in the American Society of Mechanical Engineers (ASME) Student Mechanism and Robot Design Competition at the International Design Engineering Technical Conference. 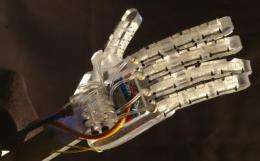 The winning entry was RAPHaEL 2, a second-generation version of a robotic hand that previously won an award from the Compressed Air and Gas Institute. Held in San Diego, the ASME competition included undergraduate and graduate school teams. RoMeLa bested graduate student teams from MIT and the University of California Berkeley, and an undergraduate team from Purdue University, said Dennis Hong, director of RoMeLa and an associate professor with the Virginia Tech mechanical engineering department. The RAPHaEL (Robotic Air Powered Hand with Elastic Ligaments) series robotic hand is powered by compressed air and a novel accordion type tube actuator. Because the hand's grasping force and compliance is adjusted by changing the air pressure, it does not require the use of motors or other expensive and bulky actuators, Hong said. The most significant change for RAPHaEL 2 is the closed loop control mechanism and sensors for automatic position and force feedback of the fingers using LabVIEW and data acquisition hardware donated by National Instruments. The first version of RAPHaEL relied on solenoids with a microcontroller to operate. The material that comprises the hand also were changed to a durable polycarbonate material, replacing a fragile acrylic-based material that was prone to breakage, said Cothern. "This gives us a lot more control over the kinds of things we can do with the hand," said Cothern. "Eventually, we might be able to tell how soft an object you're grabbing is just by touching it." Additional tweaks to come: The ability to grasp small moving objects as well as the use of silicone, carbon fiber and other materials to make the hand lighter, simpler in structure, and also appear more human. As a possible prosthetic, the hand is easy to operate and its fingers are easy to replace if broken, Cothern said. RAPHaEL 2 is part of a larger RoMeLa project: The humanoid robot CHARLI (Cognitive Humanoid Robot with Learning Intelligence). Once the hand is connected to the larger body, it will be able to pick up - not just grasp and hold - objects as would a person, said Hong. CHARLI is expected one day to walk about campus giving tours of Virginia Tech to visitors and potential students.